Western Malaysia is shrouded in a dangerous haze caused by illegal slash-and-burn fires on timber and oil palm plantations in Sumatra, Indonesia. There is a state of emergency in the worst affected districts of the Indonesian province of Riau, where the fires are concentrated. The Malaysian government declared a state of emergency in the towns of Muar and Ledang in Johor state, where the Air Pollutant Index level reached 746, the highest recorded in 16 years. In Singapore on Friday, the Pollutant Standards Index hit 401 – the highest in Singapore’s history. The level dropped to “moderate” today. June 19, 2013; NASA image by Jeff Schmaltz. The UNESCO World Heritage town of Melaka is also blanketed in smog. 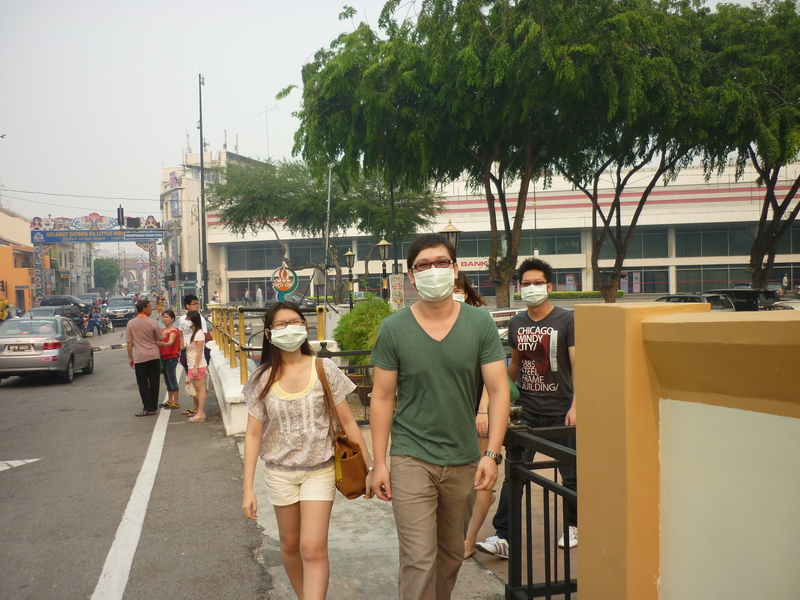 In one area of Melaka state the pollutant index level reached 443 today. The haze began six days ago, and could last for weeks. All schools and pre-schools will be closed in Melaka and Johor states tomorrow (Monday) and, in Johor, all government offices will also be closed and there will be a shut-down in factories and quarries and on plantations and construction sites. Only hospitals, clinics, pharmacies, restaurants, and supermarkets are allowed to remain open during a state of emergency, and public transportation continues to operate. In Indonesia’s Riau province, the pollutant index reached 400 on Friday. Local hospitals recorded increases in cases of asthma and lung, eye and skin problems. Indonesia has begun seeding clouds in an attempt to create rain to extinguish the blazes and helicopters are being used in the fire-fighting operation. 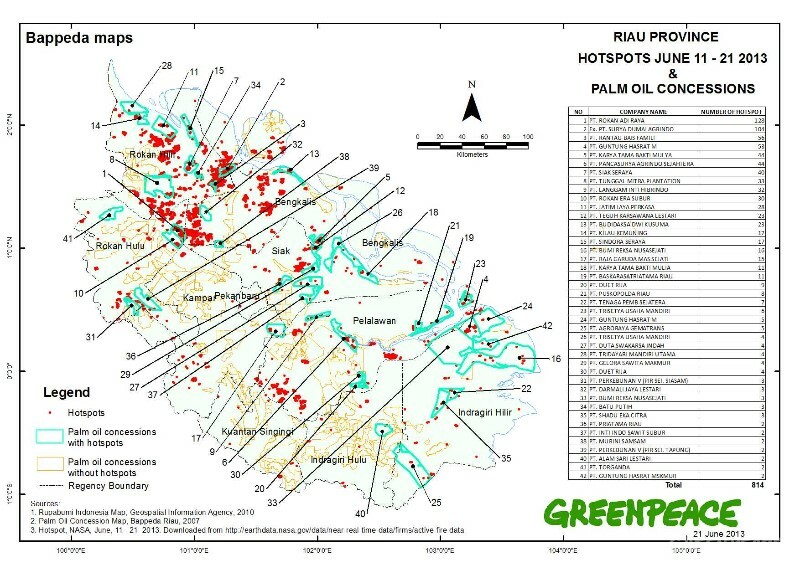 Greenpeace International’s analysis of NASA hotspot data in Sumatra from June 11-21 has revealed hundreds of fire hotspots (major fires detectable by satellite) in palm oil concessions owned by Indonesian, Malaysian, and Singaporean companies. “Fires across Sumatra are wreaking havoc for millions of people in the region and destroying the climate,” said Bustar Maitar, who heads Greenpeace Indonesia’s forest campaign. 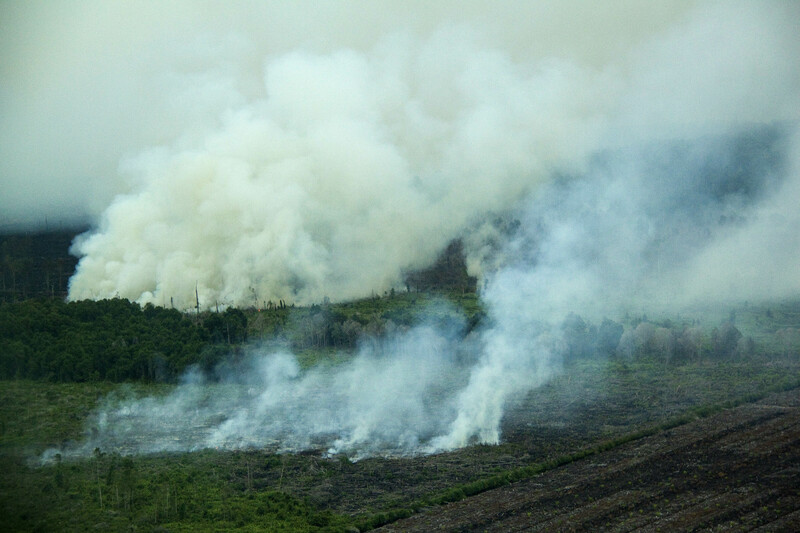 Many of the fires in Sumatra are in carbon-rich peat forests. Indonesia’s peatlands cover less than 0.1 per cent of the Earth’s surface, but their destruction is causing 4 per cent of global greenhouse gass emissions every year. According to Greenpeace, the annual clearing of Indonesia’s peatlands releases some 1.8 billion tonnes of greenhouse gases and some put the figure at 2 billion. Indonesia is now the world’s third largest emitter of greenhouse gases, following behind the U.S. and China. No less than 10 million of Indonesia’s 22.5 million hectares of peatland have already been deforested and drained. Fire-fighters in Indonesia are overwhelmed with the task they face and have been battling the blazes for two weeks. Fires on peatland are notoriously difficult to extinguish, and it can take hours to put out a blaze on just one hectare of land. 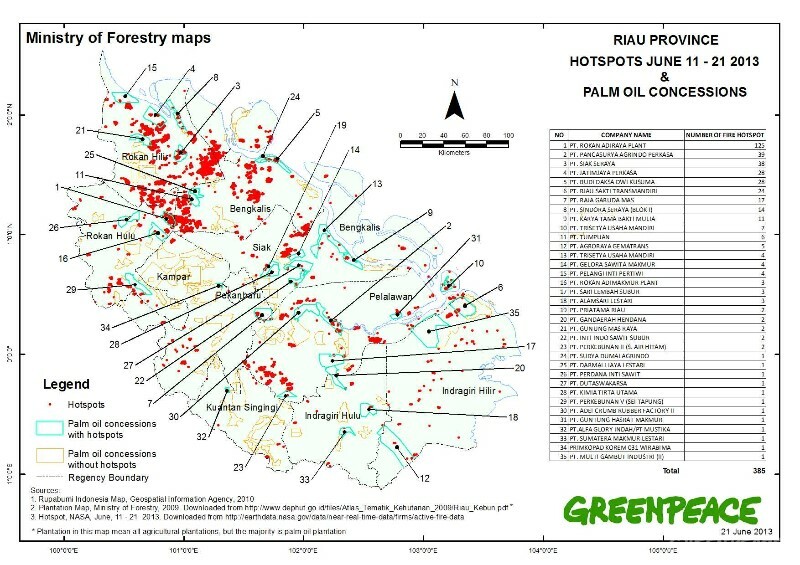 To identify the palm oil companies most associated with fire hotspots, Greenpeace overlaid NASA hotspot data with two sets of concession maps. “The lack of government transparency makes it very hard for independent monitoring; concession maps are incomplete, data is lacking, and we clearly have weak enforcement of laws,” said Greenpeace Southeast Asia forest campaigner, Yuyun Indradi. Greenpeace says half of the fire hotspots detected from June 11-18 are in areas that should be protected by Indonesia’s forest moratorium. The Indonesian government has blamed eight companies, including Sinar Mas and Asia Pacific Resources International (APRIL), for the fires. “The majority of hotspots in Riau province are inside APRIL and Sinar Mas concessions,” senior presidential aide Kuntoro Mangkusubroto told Reuters. The company said that all the fires it had detected started outside of its concession areas and spread into its concessions. The Singapore-listed palm oil producer Golden Agri-Resources (GAR) and its Indonesian subsidiary PT Sinar Mas Agro Resources and Technology (SMART) say there are currently no hotspots or fires in GAR or SMART concessions and that the companies are firmly committed to a zero-burning policy. GAR is part of the Sinar Mas conglomerate, but is run separately. Asia Pulp and Paper and the multinational palm oil producer Sime Darby also denied accusations that there are fires in their operating areas. The US-based World Resources Institute (WRI) said initial data showed that half of the fires are burning on timber and oil palm plantations. “Most of the NASA fire alerts are located within the province of Riau, and chiefly within the boundaries of timber plantation and oil palm concessions. About 52 percent of the total fires occur within these concession areas. 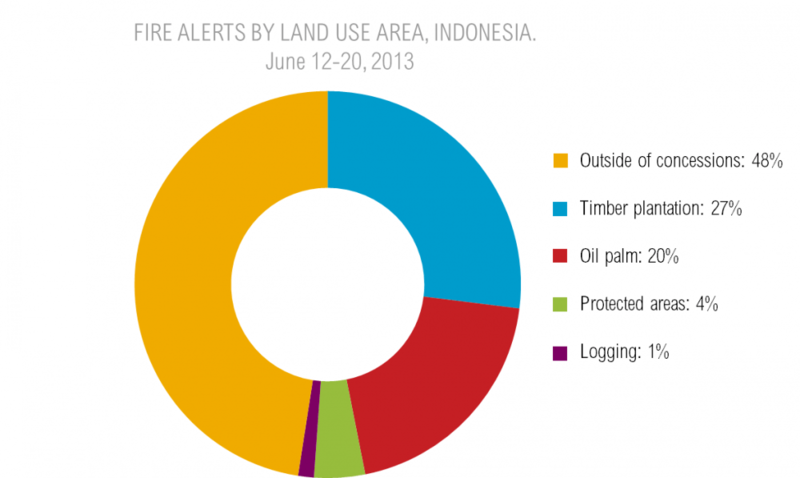 Far fewer fire alerts are located in protected forests or in concessions for selective logging. There are nine Sinar Mas timber plantations on the WRI’s June 12-20 fire alert list. According to the WRI, there are hotspots within the concession of PT Tunggal Mitra Plantation, a subsidiary of PT Minamas Gemilang and a Sime Darby company. Sime Darby says TMP is unable to exert control over activities beyond its operating areas and where land is occupied by others.It said 2,474 hectares of TMP’s 13,836-hectare concession are occupied by local communities. The WRI also cites the Singapore-listed palm oil producer Wilmar International as one of the companies with hotspots on their land. Land burning by oil palm plantation owners was the main cause of the massive fires that wreaked ecological, economic, and health havoc in Indonesia and Malaysia in 1997-1998. 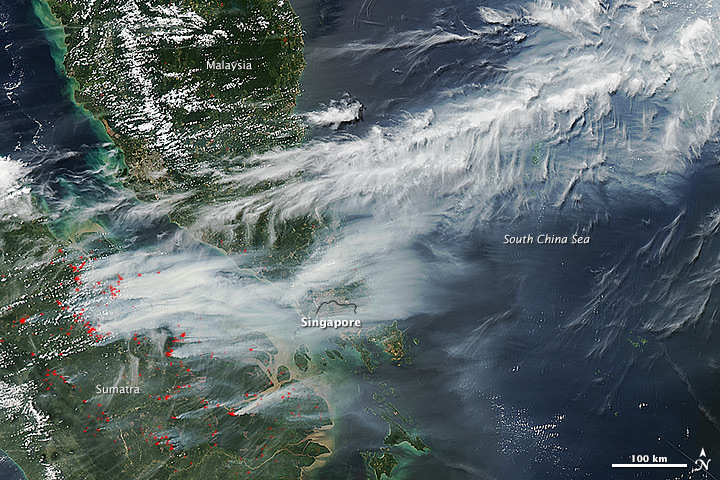 In October and November 1997, the haze from fires in Indonesia spread as far the Philippines to the north, Sri Lanka to the west, and northern Australia to the south. In the Malaysian state of Sarawak on Borneo, there was a pollution index reading of 860. Fires burned thousands of squares miles of rainforest, plantations, conversion forest, and scrubland in Kalimantan, Sumatra, Sulawesi, Papua New Guinea, Bali, Lombok, and Sarawak. According to government statistics, 750,000 hectares were affected, but environmental organisations said at least 1,714,000 hectares went up in smoke. By mid-1998 the estimate had climbed beyond five million hectares. It was estimated that, in 1998, between 180,280 and 284,000 hectares burned in East Kalimantan alone. At least 2,800 hectares of the environmentally precious Tripa peat forest in northern Sumatra were devastated by fires in March 2012, and most of the hotspots occurred on the deepest peat. In just five days, there were no less than 87 fire hotspots in three of the oil palm concessions within Tripa (those owned by PT Kallista Alam, PT SPS 2, and PT Dua Perkasa Alam). This was the highest intensity of fire hotspots recorded in a 5-day period in Tripa since satellite monitoring of Indonesia’s fire hot spots began in late 2000. Indonesia is the only member of the Association of Southeast Asian Nations (ASEAN) that has not ratified the ASEAN Agreement on Transboundary Haze Pollution, signed in 2002. Tripa burning in 2012; photo by Carlos Quiles.